By Toutatis, Asterix and Obelisk are back on DVD! That’s right, Madman have released another wonderful tale of our favourite French inspired hero Asterix as our little hero once again defends his village in Gaul from the nefarious Roman invaders. This time, Asterix has been challenged Vitalstatistix, a Gaulish chief who has been “politely” persuaded by the Romans to fight. Of course the little pompous Asterix believes this will be an easy task, however when the magician Getafix is hit on the head, he forgets how to make the magic potions which powers Asterix. This classic tale features action, adventure and best of all comedy which can be watched by the entire family. 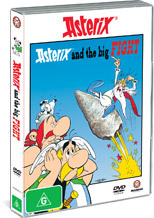 Featuring some great characters which are quite relatable, Asterix the Big Fight is probably one of the more enjoyable DVD’s of the series and feature some memorable moments. Best of all, even though the animation is a little dated, the story is as fresh and interesting as if it was made today.